The Obama campaign's new ad uses McCain's past statements. (CNN) - A new Barack Obama campaign ad targeting John McCain's choice of Sarah Palin as his running mate is making buzz not so much for what it says, but for what it doesn’t. The 30-second spot is entirely without a narrator, and instead shows John McCain's past statements appearing to acknowledge he lacks expertise on economic issues. “I’m going to be honest: I know a lot less about economics than I do about military and foreign policy issues. I still need to be educated," McCain said in a 2005 interview with the Wall Street Journal. 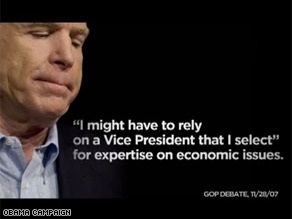 A quote from McCain in a November 2007 CNN/YouTube debate is also shown, when the Arizona senator said, "I might have to rely on a vice president that I select…"
A graphic is then shown displaying the question, "His choice?" - before showing Sarah Palin winking at the vice presidential debate. The Obama campaign says the ad will air in key states. I thought you would make it through to the end without going there. You've still got my vote, but you made me die just a little inside. If I was McCain I would never question Senator Obama's strength and tenacity and his ability to fight back! How can any person vote for this Palin? I still can not believe she was elected a Gov. If I was even close to voting for McCain her being picked would have me running to Obama/Biden. People vote for Obama/Biden the only true change. Let's face it, Palin was a pick made on a "August First" mindset with little attn paid to actual qualifications. Now that's what I call a forward thinker, don't you? It is about time. I feel badly for Ms. Palin in some respects, but McCain's judgement has failed him for the last time. I'm a country first person, and there is no way, w/ a one-in-three chance his VP would need to step in as President (given his age), that she would be effective. We would be so vulernable. The world, and those that want to destroy us, would be drooling. I'm saddened after all of his service to this great country, that he would seem to think so little of its future and safety. It's effective to use McCain's own words against him. If he had any concern for the economy he'd have picked someone like Mitt Romney as his running mate. Palin has no credibility on the economy. McCain's choice of her as a VP is nothing more than a pander to the base. His "Country First" mantra is just empty rhetoric. Sweet. About time Obama pointed out the obvious. Sarah is unqualified. Oh! one more thing, it's called spell check people, please use it. McCain and Palin are both totally unqualified for the positions they are running for. It is actually scary to think there are people who are voting for these two. McCain can't even run a campaign, and he is qualified to run the U.S.A.? Absolutely absurd! And Palin? Does anyone else get the feeling of fingernails on a chalk board when she opens her mouth and starts to speak? I have heard enough of her nasel, irritating voice, not to mention the nonsense she speaks! Is CNN endorsing Palin and McCain? Remember....CNN is not running for office and will be remembered after this election for what you guys have said and done. Only a fool would vote for McCain and that dizzy Palin. If you were doing your job reporting the news......You would have found out about who Bristol's baby's father and who it really is. It is all over the internet....why haven't you broadcast that her baby's father is a black young man. We will know when the baby comes out beige. What about the woman licking Palin's face......my, my, my, Cnn.....stop repeating your news coverage so much....some of us watch you all day.....show us something better......stop being one sided in your reporting on the election...you're showing your true colors....white. The Truth is in the picture – Her picture speaks volumes! HAHA!!! So true... Relying on Palin to lead US out of this economic blunder!! McSame will continue Bush's policies and Palin will introduce worse policies than Bush. CNN – Please Post THIS! Finally. I hope this ad strides a chord with people who, "are looking for someone like them. A plain-spoken president", as if they haven't already had that. Anything that proudly displays the Republican war on intelligence is a winning ad in my book. Oh poor baby, remember the old saying, if you point one finger at them three fingers are pointing back at you. You have been critizing both Obama and Biden, what is good for the goose is good for the gander. Gov Palin as of lately you have been screaming about Obama being a Socialist? Remember in your speech when you arrived in the 49 un-American states, you brag to everyone how you gave Alaska $1200 dollars... Now someone needs to say that to you. You are one can shy of a "Joe six-pack." It's true, McCain said it out his own mouth that he didn't know anything about the economy. No noe twisted his arm to pick Sarah Palin. These were all chioces he made on his own. But he question Baracks judgement. His was the one choice he had to get right before the election. He may as well accept defeat. Go Obama!! Were all behind you 100%!! You have got to be joking right? This is not even one millionth of the negativity that has been run against Senator Obama – you are just fooling yourself – better get over to your Faux News site to make your stupid comments.